Home / Medals and awards / 1917-1945 Finnish medals / Medal bar of 4 medals for a civil defence man. Medal bar of 4 medals for a civil defence man.Condition: good, some tarnish. Ribbon: original, faded. Nice 4 medal bar. 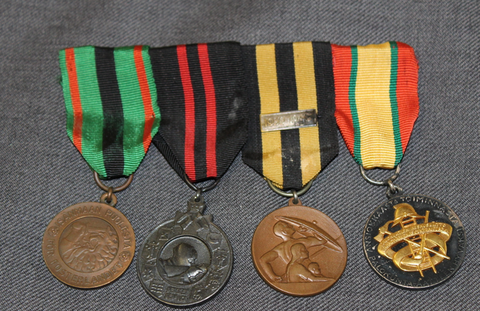 from left to right: Medal of Merit of the Liberty 2nd class 1941, for civilian merits during the time of war, commemorative medal of winter war, civilian defence medal 2nd class with 1939-1940 bar, finnish fire-figters association medal.